It’s time to redecorate your living room, but you’re at a loss as to how you can modernize the room without spending a lot of money. It’s been our experience that the quickest and most affordable way is to get new table lamps for living room redesign purposes. Not only is this decorating trick the best fix, but you’ll also find that it’s super fun. Before you go online shopping to find table lamps for living room spaces, we have some tips to finding what you want. The style and type of table lamp to add to your décor depends on your personal style and preference. Below are 4 things to figure out before you redecorate your living room. 1. What Ambiance are you Seeking? The style of table lamps for living room décor depends on how you want to feel when you enter the room. If you’re entertaining guests, what type of atmosphere are you hoping to create? Rustic Cabin in the Woods: Table lamps for living room rustic styles emphasize natural, rugged beauty by embracing earthy colors and organic warmth. Tiffany: A Tiffany table lamp for living room transformation is ideal when you want a high-end designer feel in your living room. Tiffany lamps are considered part of the Art Nouveau Movement. Traditional: Table lamps for living room traditional styles feature rich, warm, inviting colors to create an ambiance from various centuries. 2. How Important is Practicality? Since Tiffany table lamps for living room styles are more expensive, you want to consider who uses the room. For example, you might want to reconsider if you have teenagers who like to get physical in the living room; or if you have active small children who might not understand how important this type of lamp is to you. Another consideration is pets. Do you have a hyper dog that’s left alone throughout the day? When it comes to table lamps for living room spaces, the tiniest of details can make a huge difference. You can turn your boring space into an inviting, cozy retreat, or into a bright and cheerful hub for family and friends. 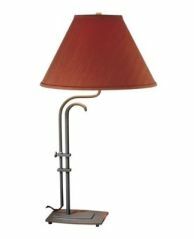 The style of table lamp you choose is important for creating either ambiance and lots of light, or for creating dim lighting with a table lamp that pops. 4. Where Will the Table Lamps go? Where you’ll put the table lamps for living room redesign should be determined right away, along with their purpose. Will a table lamp sit high on a shelf or close to the couch for a cozy feel? You want to make sure the lamp will fit in the space, and you want to give the amount of lighting you’re looking for. We hope we’ve given you lots of ideas on how to decorate with table lamps for living room ambiance. By now you should be excited to start shopping. May we suggest checking out our website to get what you need? At Crescent Harbor, we take pride in our selection of affordable table lamps that will transform your living room into what you envision. Whether you’re looking for a rustic, traditional, or elegant look, we’re sure you’ll find what you’re looking for. Copyright � 2007-2013 Crescent Harbor All Rights Reserved.